Beat till smooth and spread evenly over brownies. Chill for a few minutes to set. Melt butter in glass bowl in microwave. Add chips and cook at 50% power, stirring every 30 seconds, until melted and smooth. 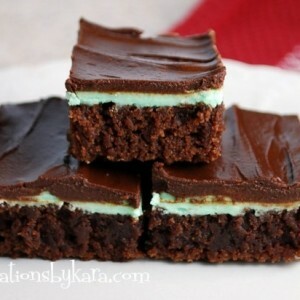 Drizzle or spread over mint layer. Chill for 1 hour.